Textile House: Another one done plus an Extra! Another one done plus an Extra! This one has left me a bit iffy. I am not a real fan of solids but with all the beautiful quilts that emerge with white sashing or solid backgrounds, I had to give it a shot. 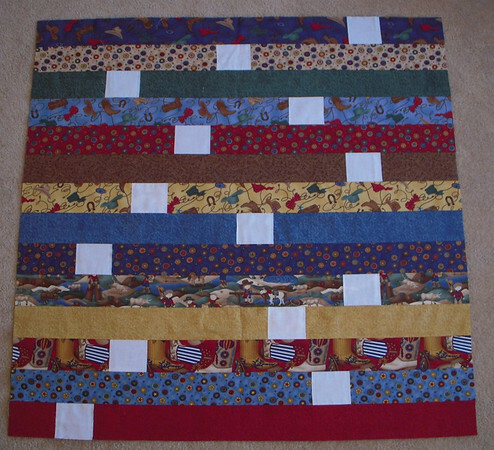 After seeing Vanessa's table topper here, I was inspired to use the same concept for a baby quilt. 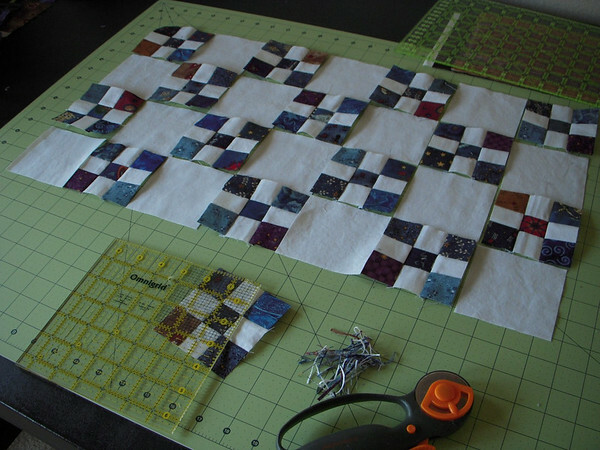 So last weekend, after I finished the other baby quilt I started this one. 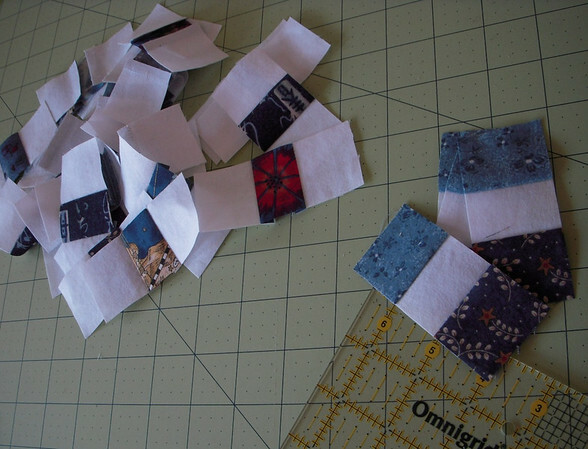 I set off to make the strips for the nine patches. I made them 6.5" in length to have different sets that would add a bit of variety to the blocks. 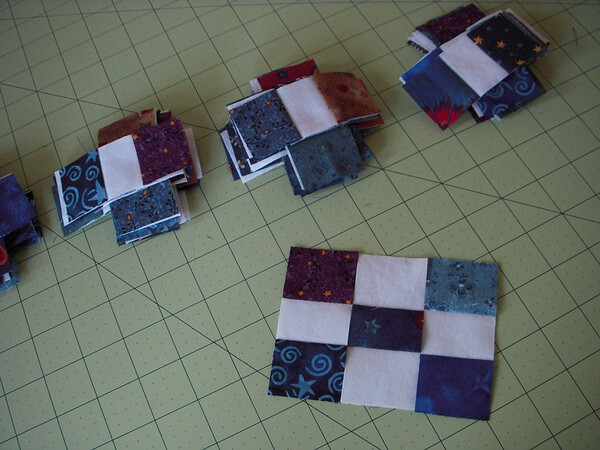 I then cut the strips into the 9 patch units. And auditioned the blocks. These will end up being 3" finished blocks. Off to sew the sets into the 9 patch. I am a pinner as you can see. I TRY to get my points to match, seams to meet, etc. The only way I can do that is to pin and honestly, it doesn't always work, but at least I try! Then I trimmed the blocks. 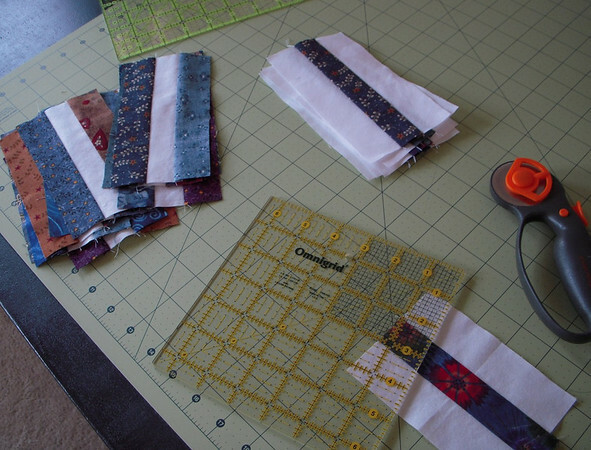 Since I don't have a scant 1/4" foot and have to fudge things a bit during sewing, I trim to get to the proper size. 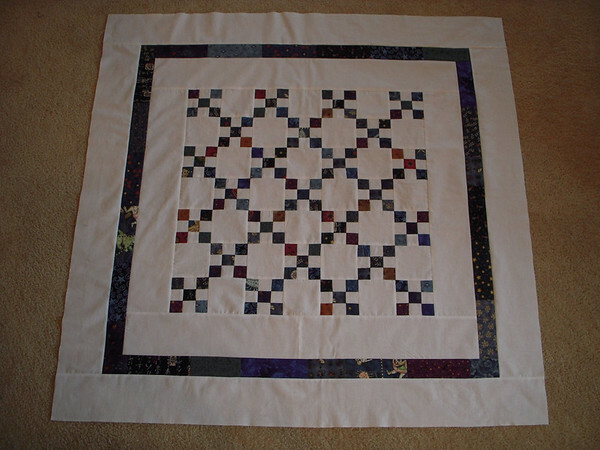 I sewed the remaining scraps to make one of the borders, then I put it all together and I was done! Now, I almost didn't finish this one because after I made the center I was not thrilled with the whole solid white. I REALLY was not happy with the whiteness of it all. I eventually did finish it this weekend because I don't want any more UFOs in my pile and I have hopes that after quilted and bound in blue it will look great! But in the mean time... I went off searching for a bkup. I saw a pattern made by Crazy Old Ladies called Baby Boom that was VERY simple and was inspired to give it a try. I needed something quick and easy to make and this fit the bill. This is suppose to be a two hour quilt and I can say it is definitely that. I sewed the squares over the strips leaving the raw edges so that after washing it will look a bit scruffy. So that was my weekend. I have these all marked up for quilting so I just need to baste and start quilting. I think I just might be able to get them done by the end of the month. This week I'll be traveling to New England for business but also to visit my sister but before that I'm going to my guild meeting and most likely will join in the workshop being offered on Wednesday by Lynn Roddy Brown. I'm defintely keeping myself busy! 7 comments on "Another one done plus an Extra!" I love your little quilts! The nine patch has such nice contrast. Show off! LOL! 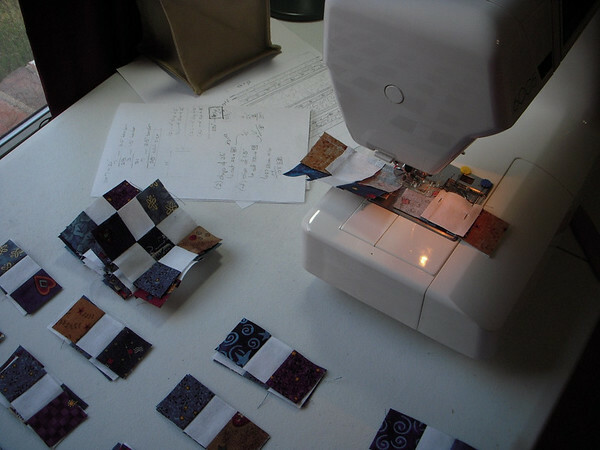 I can make two quilts in a weekend too y'know...I just don't want to, hahahaha! 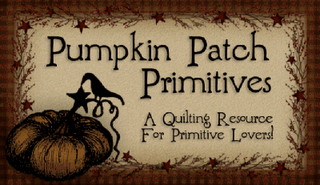 OH your nine patch is lovely, VERY much like Kelly's quilt along sample on today's post! SOOOO many little pieces. On the other quilt, although cute those white squares do stand out. 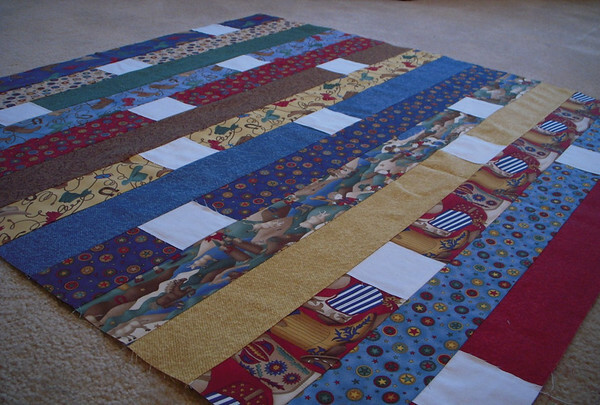 How about adding an applique to those blocks or some fun quilting design in a dark thread??? Oh, I love all three of your quilts. I think we must have been on the same page with the 9 patch quilts. Yours is lovely, and I especially like the Thimbleblossoms quilt! Way to sew. Oh your baby quilts are adorable! I do like all the white on the little boy blue. I'm sure the new mommy will too. 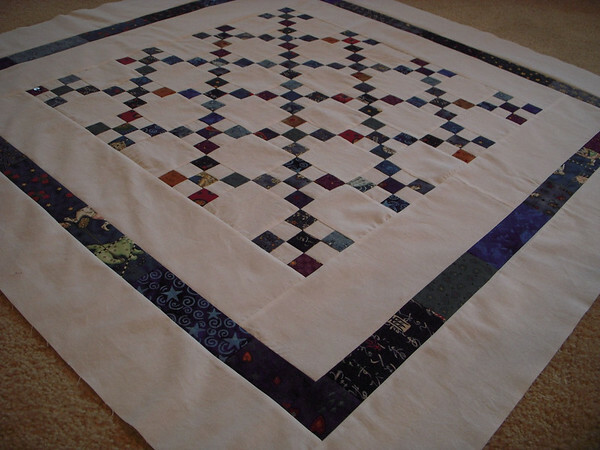 I also love the Timmbleblossom quilt. It looks like a lot of fun to make. There is just something so neat about a nine patch block. I fall for them every time! Great job on all of them! I didn't do quite so well this month! 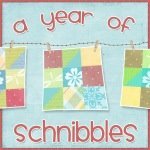 One last top for September - A Schnibble! !